By the time I sat down to polish my nails last night, I was really, really tired. Still, I sat down and searched through my stamping plates, hoping I'd find inspiration. First, I'll take a moment and blame Leggy Legend for demanding I use it sooner than later. I had made up my mind early in the day yesterday of that much. Outfit planned and everything! But back to the nails... I've got a plate full of lace patterns, and it just wasn't doing anything for me. Then, there were a bunch of simpler designs, but no real DELICATE prints. So, I axed the whole "print" part of the prompt and started thinking about the word DELICATE itself. 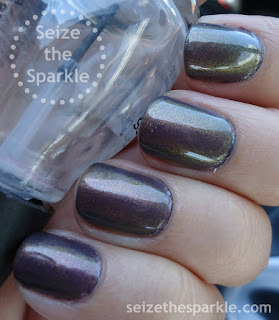 It makes me think sheer and subtle, and that led me to... shimmer polish! If I had to come up with the most DELICATE and subtle finish of all the finishes in nailpolish land... shimmers. are. it. 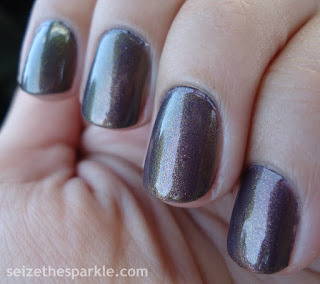 Once I turned my thinking toward shimmer polishes, I remember the lovely Choo Choo Choose You from China Glaze. It came out last Fall, enjoying quite the bit of popularity! It's a complex shade, but in a super subtle way. Choo Choo Choose You contains extra-fine shimmer that flashes red to gold to green, in a sheer duochrome base that shifts from a dark bluish-purple to purply-gray. 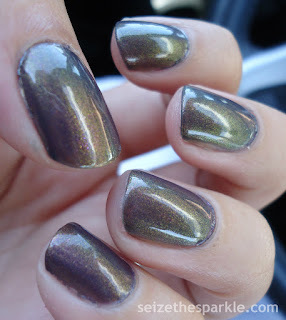 After three easy coats, I sponged on Leggy Legend, a super-pigmented metallic copper shimmer. Since the theme of the day was DELICATE, ahem, SUBTLE... I added another coat of Choo Choo Choose You to tone Leggy Legend down. I wanted a little more shimmer in a different color, so I added a coat of Sweet Candy from NYC color. That added a nice pink shimmer that warmed the whole layering up. Adding a little shimmer didn't change the look of Choo Choo Choose You drastically, but that was kind of the point. Just a subtle change. I honestly love shimmer polishes for this exact reason! They're the perfect thing to top off a layering, giving it that little bit extra that even Elle Woods would be proud of! And honestly, when is more sparkle ever a bad thing?! ?